Rankings after 2 events here – don’t forget that the event at Glen Dye this Sunday counts towards both (JD)2C and Gramp Champs. Bogendriep saw the final event in this year’s competition and here are the final rankings. and trophy/medal winners. And well done to the Maroc winners and everyone else who took part of course! Jon Duncan Junior Deeside Cup 2018 full rules and points scheme and list of events. For individual event results check the Gramp/Maroc websites. It turned into a beautiful winter’s day at Back O’ Bennachie (after a cold wet start) – blue skies, no wind, and a tough hilly forest and moor to test you all. Here are provisional results and split times. Routegadget has been loaded here, please add your routes! You can also analyse your splits on Splitsbrowser. Splits are also loaded up to Winsplits Online. Taken a wee while (sorry – holidays and handovers) but results now uploaded to BOF site and ranking points will be calculated overnight 20/2/18. Latest (JD)2C Rankings after Scolty here. The (JD)2C competition will be run over 10 events with the best 5 scores counting for each runner. Big congratulations to Oli Robertson who retains the M8 Trophy and Sam Griffin for 2nd M14, just pipping Maroc’s Joel Gooch at the final post , and Josie Gomersall 2nd W16. 3rd places go to Emily Robertson W8, Kirsty Farquharson W12 and Robert Prince M10. Trophies and prizes will be awarded at the Gramp AGM. Any Junior from Gramp or Maroc is automatically entered into the (JD)2C. You win points by running in any of the 9 nominated local Level C races listed below, with a sliding scale depending on your course and how well you do. To try and keep things as fair as possible, only half points are awarded to shadowed competitors which is why we ask you to declare this when entering. We hope you enjoyed running at Scolty. It’s a hilly and physically tough area in some places, fast in others, and the navigation can be testing – especially near the far start on Hill of Gouach. The air temperature of 5 degrees felt chilly in the tent, but was pleasant enough on the run. Cold feet, though! (the forest is pretty wet at the moment). Here are final results and split times. BOF results page with ranking points. Routegadget is loaded up – please draw your crazy wiggles. Click here for Winsplits split times analysis. Good to see several of the GJOs taking on the contour challenge at Forvie. Most of you made it out alive and kicking at the other end and even if you didn’t we hope you enjoyed the day anyway. Only Scolty left to go now to round off this year’s (JD)2C on Sunday 5th Nov. Don’t miss out on your last chance to boost your scores. Trophies have been gathered in already for engraving ready to present at respective club AGMs so good luck everyone and hope your name is on one! Maybe some of the GJOs would like to leave a comment about taking part in the (JD)2C this year? We’d love to find out the good, bad and the amazing bits from a GJO perspective. The dates and rules for the (JD)2C competition 2016 are linked below. This competition is for juniors from GRAMP and MAROC up to MW16 and this year the league will consist of 9 level C events plus the Scottish Championships, to be held at Balmoral in May. Well done to GJOs Dara Tivendale, Morven Farquharson, Isobel Anderson, Kirsty Farquharson, Duncan Will, Douglas Walmsley, Mairi Walmsley and Alex Lang for holding it together at Wood of Easter Clune over the weekend and not being phased by stiff competition from Maroc and MOR. They ran in courses varying from White to Light Green and for many this would have been their first taste of major competion. 264 points total gave them 3rd place overall and they also boosted their (JD)2C scores at the same time. An excellent day all round! Rules and events list below. Any questions? Contact Trevor Ricketts of MAROC or Marianne Lang of GRAMP or ask at an event. You’re automatically entered into the competition if you’re a GRAMP or MAROC Junior, all you need do now is make sure you get along to as many events as you can this year. Good Luck! The (JD)2C competition will be run over 10 x Level C events with the best 6 (TBC) scores counting for each runner. There will be 6 classes for girls and boys, using the ‘standard’ age classes, i.e. M/W8, M/W10, M/W12, M/W14, M/W16. The competition aims to find the best Gramp / Maroc junior in each age class. Juniors may choose the course appropriate to their ability. 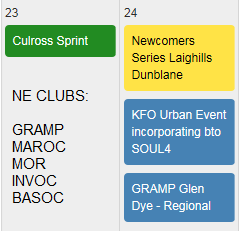 Check the clubs’ websites closer to each event for details and entries links. Draw your routes at Routegadget2 here. Analyse your split times at Winsplits here. Many thanks to all the helpers for their labours in the cold sleety weather. It’s all over for this year – Final Results and Trophy/Medal Winners. Congratulations to Maya Reynard on winning W10 and Hannah Will, Morvern Farquharson, Isobel Anderson, Naomi Lang, Daniel Smith, Paul Caffyn and Lachlan Kirk on winning medals too. Shadowing is shown in the results tables by the number being in italics. If you notice an incorrect record of shadowing at any event in the results, please contact Trevor Ricketts to correct using this contact form. Well done to Morvern Farquharson who held on to her lead to win the W8 Trophy! Trophies and certificates for (JD)2C and GRAMP Champs will be awarded at the AGM on Saturday. Hope you’ll all be there to receive them? And that you’ve been busy planning something scrummy to bring for the bring-a-dish supper? See you there! 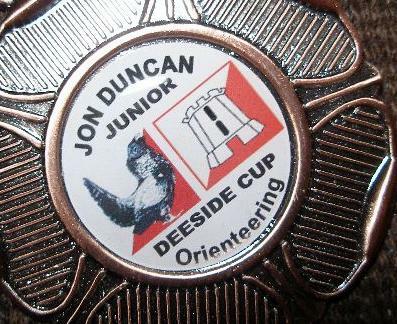 Congratulations to all GJOs who took part in this year’s Jon Duncan Junior Deeside Cup and here are the Final Results. Usually, we present the trophies at the GRAMP and MAROC AGMs so if your name is on one then a special congratulations and GJOs please come to collect your trophy on Saturday 8th Dec.
Laura Smith, Isobel Anderson and Maya Reynard who packed out the top three places in W8 – looks so good when it says GRAMP, GRAMP, GRAMP! Also Ailsa Anderson and Josie Gomersall for 1st and 2nd in W10, Naomi Lang and Kate Wilkinson 3rd in W12 and W14 respectively. The boys struggled a bit this year but well done to Patrick Lang, Keith Yardley and Jack Gomersall who all came 3rd in M8, M12 and M16 respectively and Sasha Chepelin who cruised to 1st place in M14. And everyone who took part in this year’s (JD)2C – even if you didn’t get into the top three places hopefully you enjoyed the friendly competition with Maroc and the chance to run in some great areas in Deeside.